The Best Seller Gift Basket is a gift of Camellia Brand best selling flavorful favorites. This gift includes Camellia Brand signature Red Kidney Beans, Large Lima Beans and Blackeye Peas. 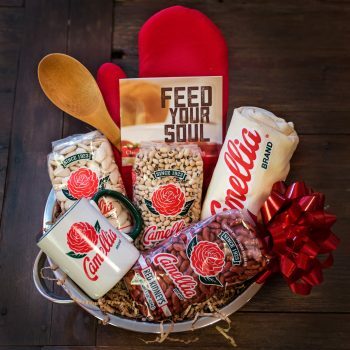 Along with great Camellia branded merchandise for the kitchen – including apron, mug, and wooden spoon – a versatile assortment of beans will soon have the lucky recipient simmering delicious one-pot meals, soups, stews, and chili for family and friends. Baby limas are one of nature’s healthiest foods – packed with fiber, vitamins and minerals. Named after the capital of Peru, lima beans, like common beans, originated in Peru, where they were cultivated even before corn.